Hundreds of Stony Brook students, faculty and staff rallied to support academic programs in danger of being cut at the March for Humanities on Wednesday. The rally, organized by the Graduate Student Employee Union, kicked off at the Student Activities Center Plaza at 12:30 p.m. and evolved into an unwavering demonstration that lasted nearly three hours. Protesters brandished handmade signs including phrases such as “#farbehind,” “Think Don’t Shrink The Humanities,” and “Hispanic Studies, More Than Languages.” Another poster equated the Dean of the College of Arts and Sciences Sacha Kopp and President Donald Trump over their willingness to defund the arts. A mass email sent by Kopp on May 4 said this year’s evaluation of enrollment and resources led to recommendations for suspended admission to the theatre arts, cinema and cultural studies and comparative literature undergraduate programs. In a separate, earlier email sent to department faculty, Kopp said the proposal aims to “reduce our expenditures by $1.5 million.” The email also stated that the European languages, literatures, and cultures department, the Hispanic Languages and Literature department and the cultural studies & comparative literature department would be combined. It went on to add that the doctoral programs in cultural studies, comparative literature, and Hispanic languages and literature would be suspended. In the face of university budget cuts, the backlash transcended the academic disciplines in danger of suspension. Atchison is one example of a student unaffected by the cuts who came to support the march. Visal Thalawe Arachchilage, a junior chemical engineering and chemistry major, said the march was a good way to tell the administration that the campus community should be involved in these decisions. After speeches at the SAC Plaza by representatives from the affected programs, the protestors marched toward the Administration Building and gained momentum as the crowd looped past the Staller Center, continued up the steps and packed into the Melville Library atrium. From there, they marched to the third floor, where Kopp’s office is located. After a 30 minute sit-in in the hallway, Kopp refused to meet with the group. Protesters then marched back to the Administration Building to Provost and Senior Vice President for Academic Affairs Michael A. Bernstein’s office. 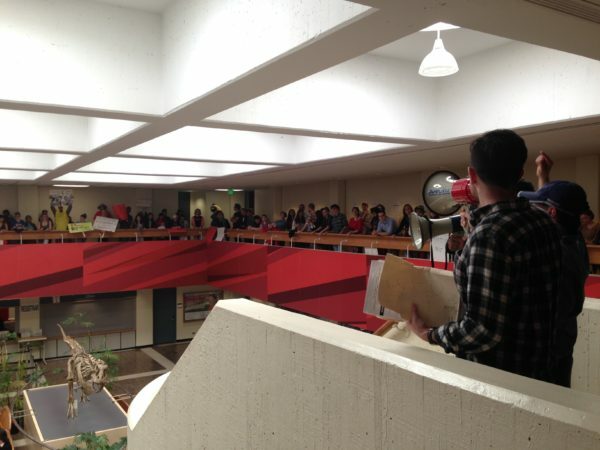 They noisily poured into the lobby and filled the upper balcony, but the provost did not appear to address marchers. For a final demonstration, the group rerouted to crash an ice cream social being held in the Wang Center for donors and alumni, where the march eventually concluded. Anna Sitzmann, GSEU campus organizer and a philosophy Ph.D. candidate, said the administration’s reaction was disappointing but not surprising. Sophia Basaldua, a comparative literature Ph.D. candidate, said she has already felt the effects of the proposed cuts. “It means major upheaval, and this kind of upheaval distracts all of us from our mission of educating undergraduates, performing research, and distracts faculty from mentoring the Ph.D. students that they are still responsible for,” Basaldua said. The proposal reflects “a complete disregard for research” in the humanities, said Alejandro Chacón Cárdenas, a Ph.D. candidate and language instructor in the Hispanic languages and literature department. “Serious research is not restricted to ‘hard’ science and technology, but a premise as basic as that seems to be absent from the frame of mind that is behind this decision,” Cárdenas said. If these programs are cut, course offerings will be limited, and some professors, especially those who do not have tenure, could be laid off, Cárdenas said. These proposed cuts represent a serious threat to the cultural diversity of the Stony Brook campus, Sitzmann said.